For many allergy sufferers, understanding why goldenrod and ragweed affect us differently and how to tell them apart could help us avoid allergies – not to mention unnecessarily removing native goldenrods! 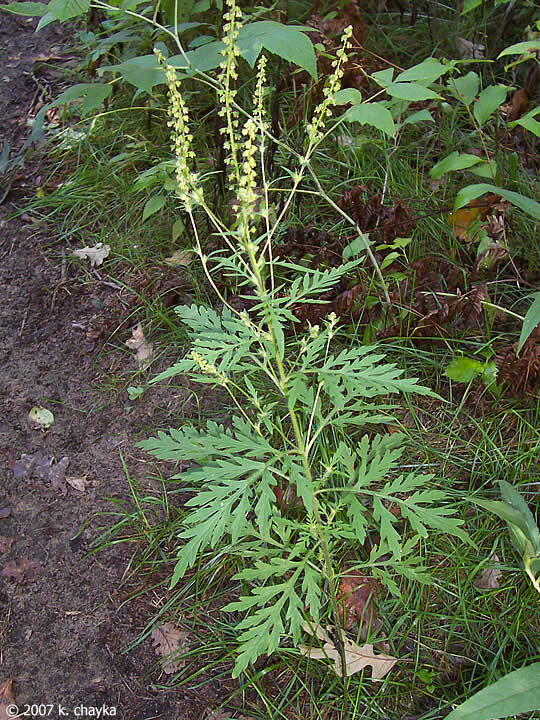 There are three common ragweed species in Minnesota: common ragweed, western ragweed and giant ragweed. Common and giant ragweed are annual plants, while western ragweed is a perennial. These plants are all defined by their lobed leaves of varying sizes and their branching stems. Flowers are produced both at the stem tips and at the upper leaf bases: the male flowers – located at the tips of the stem – produce copious pollen, while the female flowers are small, greenish, and non-descript. These plants can grow in clusters or singly. While common and western ragweed can grow up to four feet tall, giant ragweed can reach heights of fifteen feet. Goldenrod, on the other hand, is a single stemmed plant that often grows in patches. There are some 45 species of goldenrod in Minnesota and many of these species hybridize, making identification of a specific species difficult. However, telling them apart from ragweed is relatively easy. These single-stemmed plants have unlobed, lanceolate leaves, arranged alternative on the stem. Leaves are often densely packed on the stem, giving them a slightly whorled appearance. Their flower clusters occur in many forms, but always at the top of the plant. Many species’ flowers occur in spikes or flat-topped clusters. So why is ragweed to blame for much of our allergies and goldenrod isn’t? This is due in large part to each plant’s pollinator syndrome. Ragweed’s small flowers are not showy or brightly colored – characteristics that attract pollinators. Instead, ragweed is primarily wind pollinated, meaning that ragweeds rely on wind to disperse their pollen from plant to plant. Thus, they produce massive amounts of pollen to be carried along on the wind. As this pollen fills the air, some of it ends up in our nasal cavities, causing irritation and allergy symptoms. Conversely, goldenrods are both wind and insect pollinated; their showy golden flowers attract pollinators like bees and other insects. As such, they produce less pollen because they don’t have to rely on wind dispersing it to far-off plants. While many people will mistakenly remove goldenrods from their properties to avoid allergies, this is usually in effective, and only works to remove important food sources for native pollinators. In fact, many Minnesotan allergy sufferers tend to find relief in northern Minnesota, where goldenrods are plentiful but ragweeds are uncommon. So next time you start noticing your allergies kicking in, take a look around. Try looking past the showy patches of goldenrod and see what other plants may be present. The cause of your allergies may be less conspicuous than you think.